Everyone went dovish after what happened in December. Convention assumes that central bankers take their cues from the NYSE. I don’t think that’s what shook everyone up, though. Curves, ladies and gentlemen. The bond market revolted and the stock market showed serious signs of catching its contagion. Since the mainstream had been expecting a booming economy, because that is what every Economist has been saying, this was all very shocking. As was, quite naturally, the blind groping for answers. How could this have happened? Since convention also assumes central banks are at the center of everything, they must’ve taken away too much punch from the bowl. It was the Fed’s fault for both raising rates too high while simultaneously normalizing its balance sheet. Nobody really knows what that last one means, but people call it quantitative tightening so it must be! If “hawkish” monetary policies cumulative broke the markets, then shifting this way should undo some if not all of the damage. That’s the thought, anyway. 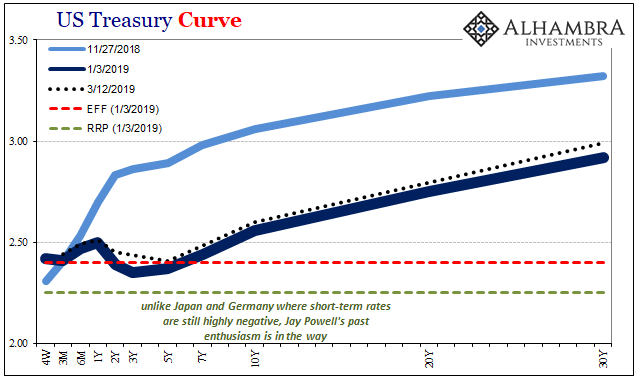 As of today’s session, before the close, the UST curve is absolutely ridiculous (again). The 5-year note is now trading almost equal to EFF (effective federal funds) once more, eleven bps less than the 52-week bill. The yield on the 5s is now significantly (3 bps) below the equivalent yield on the 3-month bill. Nominal rates from there down the curve are mere bps off the January 3 lows. This isn’t quite how “dovishness” was supposed to turn out.